Whether you are a writer who composes whimsical tales of fun-loving intrigue, or a producer of contemporary captivating thrillers, here is a collection of publishers to be considered for the unveiling of your new manuscript. We have listed 21 of the best book publishing companies in the Colorado area, many of which accept not just local talent, but international book proposals as well. From academic textbook publishers, to spirituality, nature and religion, here are the top publishers across all categories in Colorado. Each is open to unsolicited submissions. Established in 1998 by David J. Rothman, Conundrum Press is a publisher with a focus on authors from the Rocky Mountain region, publishing fiction, poetry and creative non-fiction primarily. Conundrum Press covers a wide range of topics, ranging from cooking and gardening to memoirs, regional history, environmental affairs, poetry and both literary and speculative fiction. Great examples of their preferred publishing style can be found in “A Naturalist’s Years in the Rocky Mountains” by Howard E. Evans, divulging the behavior of numerous creatures through twenty well-crafted essays. Another notable work from their collection is “A Return to Emptiness” by Chris Ransick, which presents a selection of tales concerning life, loss and love. Full details concerning the submission process can be found on the Conundrum Press submission page, alternatively contact them via email. Established in 1985 by Tami Simon, Sounds True is a publishing company based in Louisville, Colorado. With a fixed focus on books concerning spirituality and all forms of spiritual wisdom, Sounds True is always seeking submissions of books, audio-learning programs, multimedia creations and music. All content concerning spirituality, a spirit-conscious lifestyle, healing, self-empowerment and world-religions are considered. Even spiritual memoirs and spiritual fiction titles are eligible for publication. Within their range of over 1,500 individual titles are prominent works such as the open-heart awareness discourse “Shift Into Freedom” by Loch Kelly, and Megan Devine’s discussion on grief in today’s culture “It’s OK That You’re Not OK”. Sounds True provides a great list of content guidelines for prospective submissions. Please note that the only manuscript submissions considered are those supplied via conventional mail. Alpine Publications are a book publishing company which specializes in the publication of both fiction and non-fiction relating to dogs and horses. While they do at times accept manuscripts relating to other subjects in the line of children’s books, workbooks and books covering rural subjects, horses and dogs are their specialty. Based in Crawford, Colorado, Alpine Publications accepts submissions throughout the year, with both digital and hard copy submissions being acceptable. Fantastic examples of their preferred publishing style can be found in “How to Raise a Puppy You Can Live With” by Rutherford and Neil, guiding you through selecting, training and taking care of a puppy for the first year of its life, and “The Illustrated Dictionary of Equine Terms” by New Horizon’s Equine Education Center. To submit your manuscript, view the submission page of Alpine Publications, or mail them for more information. Established by New York Times bestselling author Steve Jackson and online marketing mogul, Michael Cordova, WildBlue Press is a self-publishing publishing company based in Denver, Colorado, which accepts a select range of submissions. With a focus on finding the best new talent, WildBlue strives to develop a range of award-winning authors who rise above the general mediocrity of the industry. With a transparent publishing agreement which sets out higher royalties than is commonly found, fiction authors would do well to consider publishing with WildBlue Press. The genres covered primarily are true crime, mystery books, thrillers, historical works and non-fiction business orientated books such as “Productivity Tools for Business: 57 Proven Online Tools to Recapture the Hours of Your Day” by Michael Cordova. To procure a publishing request, simply complete the form found on the “For Interested Authors” page of WindBlue Press. Baliwick Press is a publishing company situated in Fort Collins, Colorado and is renowned for its innovative novels, telling inspiring stories. Established in 2009 by a team of three innovators, Karla Ocaenak, author, Kendra Spanjer, illustrator, and Launie Parry, designer, this publishing house rose to prominence through their flagship series, the Aldo Zelnick Comic Novels. The company aims to deliver character rich books which connect young readers to educational disciplines in a cognitively immersive experience. Best sellers from their range include “Good Morning Brew” by Karla Oceanak and the illustrated chapter book “Logjam”, which is a part of the acclaimed Aldo Zelnick Comic Novel series. Submissions concerning humorous children’s and young adult fiction will be considered, with a submission form being available here. Big Earth Publishing is headquartered in Boulder, Colorado, and has a fixed focus on publishing titles relating to Colorado, Wisconsin and the West. The genres which they cover are quite diverse, spanning guidebooks, mysteries, adventure, sports, cookbooks, history, children’s content, water sports, gardening and nature. Prime examples of their preferred writing style can be found in the Southwestern anthology “Rock Art – A Vision of a Vanishing Cultural Landscape” by Jonathan Bailey which details the destruction and degradation of rock art sites, as well as “My Life as A Whore – The Biography of Madam Laura Evens” by Tracy Beach, which tells the tale of a well-known madam from Colorado. A cover letter and two to three sample chapters is requested when submitting your manuscript, as well as a brief autobiography listing your credentials. Do not send in an entire manuscript. For more details, visit the Big Earth Publishing’s submission page. BillyFish Books is a publishing company based in Pueblo West, Colorado, with a fixed focus on non-fiction. Established by Tammie Stevens, a performer and founder of animal rescue foundation, The Lazarus Fund, Billyfish Books caters to writers who are unwilling to compromise their unique content by conforming to industry-standards, beginning with the publishing of the tale of real-life explorer Jason Lewis. “The Expedition, Dark Waters: True Story of the First Human-Powered Circumnavigation of the Earth” by Howard Fisher, claimed the Benjamin Franklin Award in 2013 with its three-part discourse into the true-to-life exploration of the globe, while also taking the National Indie Excellence Award of the same year. Non-fiction submissions of travel books, adventure books, inspirational content, motivational discourses, books concerning environmental affairs, books suitable to children and animal-related content are all accepted. View the manuscript submission page of BillyFish Books for more information. Selene River Press is a publisher founded over twenty-five years ago by Stephanie Selene Anderson, who specializes in nutrition, food safety and alternative health care. Their publications are centered around the philosophy referenced in the work of Dr. Royal Lee, a leader in the proof that vitamin deficiencies resulted from processed foods are at the root of most degenerative disease. Great examples of their preferred style are found in “An Endocrine Handbook” by Jeremy E. Kaslow, and “Cooking Techniques for the Gut and Psychology Syndrome Diet” by Monica Corrado, which has been released in multiple parts. Eligible manuscripts include those covering self-health literacy, holistic health education, herbal medicine, homeopathy, professional health care experiences, research which highlights the benefits of whole-foods, organic farming & husbandry and cookbooks which focus on fresh, whole foods. Diet books and cookbooks which promote soy as a main protein are not accepted. To submit your book proposal, please view the “Write for Us” page of Selene River Press. In addition to publishing services, they also have a guest posting form readily available on their site. Established in 1975 in Boulder, Colorado, by Frederick A. Praegar and Maurice B. Mitchell, Westview Press is a leading academic publisher. They are renowned for their publication of high-quality undergraduate and graduate-level textbooks. Signature titles from Westview Press’s extensive collection include “A History of the Modern Middle East” by William Cleveland, “Feminist Thought” by Rosemarie Tong, and “Can We All Get Along” by Paula McClain. Manuscripts concerning African studies, Asian studies, Latin American studies, Middle East studies, international relations, political science and sociology are eligible for consideration. You can find more information regarding their submission process on the Westview Press acquisitions page, alternatively view their proposal guidelines found here, or contact the publisher via email. Flying Pen Press is based in Denver, Colorado and is a publisher specializing in science fiction, fantasy, role-playing game books, poker books and mystery novels. The only non-fiction which is considered is memoirs. As the brainchild of David A. Rozansky, a well-versed writer with over twenty years’ experience in publishing, Flying Pen Press makes use of a print-on-demand system whereby the costs of publishing are cut significantly. To gauge the preferred style of their accepted works, one needs but look at titles such as the steampunk adventure “Owl Dance” by David Lee Summers, and the first of the “Mountain Men” novels, “Crossed Arrows” by Terry Grosz. Before submitting your manuscript, a proposal is required. You can find full submission details on the submission guidelines page of Flying Pen Press, alternatively contact them via email for more information. Shambhala Publications is a publisher based in Boulder, Colorado, which specializes in eastern religion & philosophy. Established in 1969, this publisher carries 1,600 titles in print. From the acclaimed works of their first author Chögyam Trungpa, whose “The Collected Works of Chögyam Trungpa” has reached no less than nine volumes, to “In the Lap of Buddha” by Gavin Harrison, Shambhala carries a renowned range of authors. Submissions are welcomed with eastern manuscripts preferred, although many other genres are covered such as health, wellness, martial arts, meditation and even other spiritual doctrines such as Judaism, Hinduism, Sufism and Christianity. For more information concerning their submission process, please view the submissions page of Shambhala Publications. Alternatively, email your proposal to their editors. Love Publishing Company was established in 1968 and is a publisher who focuses on the publication of college textbooks. Based in Denver, Colorado, their range carries books covering subjects concerning counselling, social work, special education and they also publish a range of monthly journals supplied on a subscription basis. To better understand their needs, one can look towards “Language Instruction for Students with Disabilities” in its 4th edition, written by Edward A. Polloway, Lynda, Miller and Tom E. C. Smith. This discourse on language development and the diversity of linguistics is a prime example of the style of textbook published by Love Publishing Company. To make a college textbook prospectus submission, please view their book proposals page, or email Love Publishing Company. Operating out of Boulder, Colorado, Lynne Rienner Publishers was founded in 1984 and specializes in scholarly and textbook publishing. They cover international studies, comparative politics from all regions of the world, books pertaining to US politics, international military history, sociology and criminology books relating to the US. Among their more prominent books are “Undocumented Latino Youth: Navigating Their Worlds” by Marisol Clark-Ibanez, divulging the undocumented communities affected by immigration policies and state laws, as well as “Power Politics in Zimbabwe” by Michael Brattan which discusses the authoritarian rule of the former leader, Robert Mugabe. For more information regarding their publishing program, please view this page, alternatively contact Lynne Rienner via email. Open Books is an independent publisher operating out of Denver, Colorado. As a publisher of both fiction and non-fiction, Open Books covers multiple genres with the only areas not being accepted lying in romance, horror and paranormal tales, while in non-fiction self-help books, books covering diets and pseudo-psychology are also not eligible for publication. Numerous notable authors are carried by Open Books. For example, when one looks at novels such as “In the Weeds” by Mark Ozeroff, and “The Ballet Lover” by Barbara L. Baer, the quality of contemporary fiction is clear. For more information regarding the submission process of fiction and non-fiction, please visit the submissions page of Open Books. Alternatively contact them via email. Operating from Lakewood, Colorado, Unbridled Books is a prime publisher of fiction, with a focus on works which appeal to a broad audience. Established in 2003 by Fred Ramey and Greg Michalson, Unbridled Books has brought many authors to mass appeal. Books such as the #1IndieNext Pick winner “In Hovering Flight” by Joyce Hinnefeld, and “Last Night in Montreal” by Emily St. John Mandel, are fine examples of their more prominent publications. While their submissions department is extremely busy and currently has more than its fair share of publications in the pipeline, it is open to proposals. For more information, please view the contact page of Unbridled Books, or email either Fred Ramey or Greg Michalson. Please note, it is preferred that you mail only one of the founders, not both. Open to scholars of the University of Colorado and Utah State University, the University Press of Colorado has been on operation since 1965. Forty-five titles are published each year on average, with the aim of supplying the highest level of quality throughout a diverse range of educational fields. 2017 brought numerous faculty publications including “New Approaches to Teaching Folk and Fairy Tales” by Christa C. Springs and the winner of the Colorado Book Award for Creative Nonfiction “The Man Who Thought He Owned Water” by Tershia d’Elgin, among an array of other prize-winning publications. A full list of specifications and guidelines are provided on the University Press’s author materials page. Prior to submitting your manuscript, please ensure that your work is presented as a prospectus, with all of the submission details available here. Piccadilly Books, based in Colorado Springs, is a publishing company which is seeking non-fiction manuscripts concerning natural health, diet, physical fitness, nutrition and all related genres. Great examples of their preferred style can be found in “Ketone Therapy” and “Health Hazards of Electromagnetic Radiation” by Dr. Bruce Fife. The majority of their publications cover health-related concerns, with discourses and commentary on many popular diets being quite common throughout their books. When submitting your manuscript, a minimum of three chapters are requested, although the entire book is preferred, along-with an introductory covering letter stating the primarily demographic of your manuscript, as well as how it will introduce new ideas to the market. For full details concerning their submission process, please see the author guidelines page of Piccadilly Books, or present your pitch via email. Established by Doris and Tom Baker in 1956, Filter Press is a publisher with a focus on non-fiction and historical fiction related to the Southwest in general, and specifically Colorado. Their published works span a variety of genres including but not limited to youth and adult fiction, biographies, history & travel, Native American history, and picture books. With notable authors such as Carolyn Brink with her rich background in education and philosophy, reflected in her title “Class Acts”, and Colorado historical storyteller John Stansfield with stories such as “John Denver: Man for the World”, Filter Press is a well-established publisher. Filter Press is open to submissions, however only hardcopy manuscripts are eligible for review. You can find submission guidelines on the ‘About Us’ page of Filter Press, alternatively contact them via email. Seated in the foothills of the Rocky Mountains in Colorado, Fulcrum Publishing is a non-fiction publisher who is welcoming of manuscripts exploring US culture and historical subjects, Native American studies, materials relating to conservation and graphic novels based on non-fiction subjects. Established just over thirty years ago by Bob Baron, prominent author, this publishing house has received awards from numerous organizations including the American Booksellers Association, the American Library Association and even the Smithsonian National Museum of the American Indian. Excellent examples of their publishing style can be found in “America is Indian Country” by Jose Barreiro, and “Brave New World of Healthcare Revisited” by Richard D. Lamm and Andy Sharma, looking at the healthcare crisis in the US. For more information concerning Fulcrum Publishing’s submission process, please view this page, or contact them via email. Wolverine Farm Publishing is headquartered in Fort Collins, Colorado, and was established by Todd Simons. This small publisher aims to release a minimum of two books per year, in addition to their regular publishing lineup. Other than their two journals, “Boneshaker” – covering cycling, and “Matter Journal” – handling literature, art and poetry, Wolverine Farm also publishes fiction novels. To get a better idea of their publishing style, take a look at “Logodaedaly or Sleight-of-Words” written by Erzsebet Gilbert. His delightful discourse on the English language is no mere dictionary, but rather a look at the history and origin of words and phrases used by writers through the ages. To submit your manuscript, please view Wolverine Farm Publishing’s submissions page, or present your pitch via email. Suspect Press is a publisher of a quarterly magazine focused on poetry, fiction, comics, essays, art. In addition, they also publish a limited range of non-fiction and fiction books and comics. Based in Denver, Colorado, and founded in 2013, Suspect Press has driven up quite a following thanks to their events throughout the city of Denver. To gauge their preferred publishing style, simply take a look at any of their magazines, available on the following page. You will notice a preference for thought-provoking works which are suited to creative minds, exhibited through their poetry, non-fiction interviews and reviews, and short stories. For more information regarding the submission process of Suspect Press, please visit their submissions page, or place your proposal to the publisher via their contact page. Once you have proofread your novel, received feedback from mentors and loved ones, edited and proofread again, devised the perfect pitch and target market, and finally decided that your manuscript is ready for a professional editor, be sure to pick your publisher carefully. Submission to multiple publishers is always a good idea; however don’t just throw your book out to anyone. Ensure that your style is consistent with that of your prospective publishing house, while your cover letter and initial proposal itself requires personal attention and research. Compare your manuscript to that of authors within your genre or vertical, while being sure to state how your book makes a difference to your publisher. Make reference to similarities between the demographics targeted by your book, and titles carried by the publisher. The impact of your publication must be clear, original and concise. The key to getting published is getting noticed. 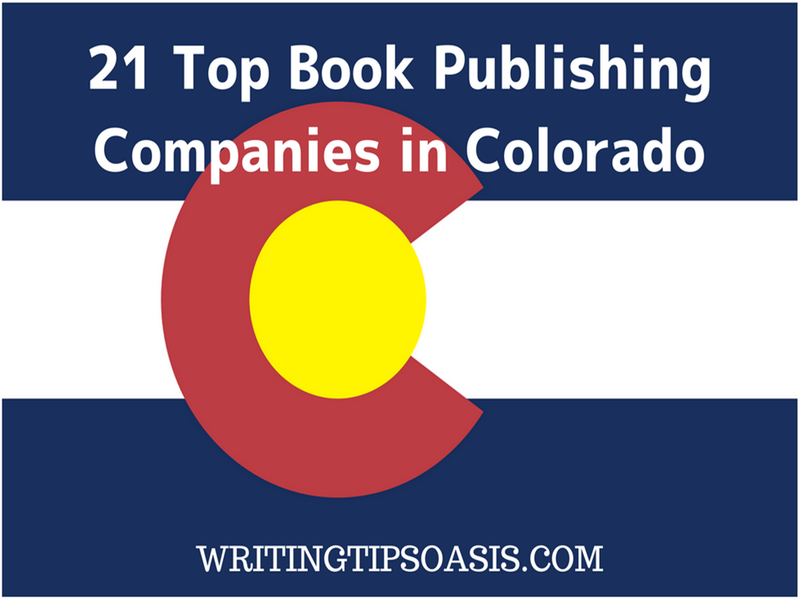 21 Top Book Publishing Companies in Colorado is an article from Writing Tips Oasis.